Richard Paul Poethig was born in 1925 and grew up in the tenements of Yorkville in Manhattan. In 26 episodes, Richard tells the story of his journey from his working-class roots to his ordination as a Presbyterian minister. The recordings of Richard reading his memoir are mixed with music that punctuates the humor and drama of his story. 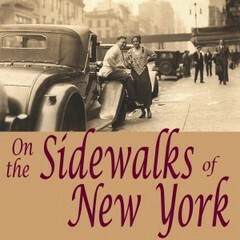 On the Sidewalks of New York is a rich historical account of living in an “old law” tenement on 80th Street in Yorkville; attending Good Will Sunday School (Madison Avenue Presbyterian Church’s mission on the East Side); leaving home to attend the College of Wooster in Ohio in 1945 before the end of World War II; moving back to New York to study under Reinhold Niebuhr at Union Theological Seminary; courtship and marriage, graduation with a Masters of Divinity, and finding a church. Chapter 11 - Going West! Richard faces the uncertainty of college life and its requirements. And his heavy New York accent marks him as an outsider at the College of Wooster.